Among the many faith feeds that pour into into my reader, there's lately been a little meme that's struggling to get off the ground. It's surfaced here and there, mostly in significantly minor print news outlets. It's fluttered around like a little fledgling knocked early from it's nest, almost catching viral air...and then falling back...and then almost catching viral air...and then falling back. The faith "issue" in question was an ad buy by American Atheists, in which they pitched up a billboard showing wise men on camels, following yonder star, with Mary and the babe in a manger under a crystal blue sky. It's really a very pretty scene. 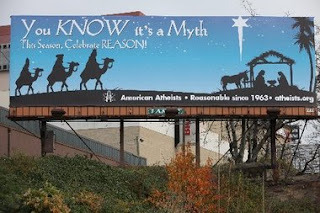 Runneth the text: "You know it's a Myth...This Season, Celebrate Reason!" It's provocative, or is intended to be, although the scene itself is so lovely that you end up getting lost in Christmas warm fuzzies evoked by those cool radiant azures. But after that first day or so, it seems that...well...no-one really cares. Perhaps that's a factor of it being slapped up near New York City, where it's really a whole bunch harder to be provocative. "Honey? That's 'provocative?' Did you see that avant-garde performance artist, oh, what's his name, last week? I still can't figure out how he got the entire narthex in there." Even Fox News, after first taking the bait, seems to have gotten distracted and wandered away, which is saying something. Shoulda done it in the bible belt, kids. Oddly enough, I wish this effort had gotten more legs. Because the billboard is right. The story of Christmas is a myth. Not, of course, in the shallow Mythbusters sort of way. Myths are not urban legends. They aren't trivial fabrications. They aren't falsehoods told and retold and retold until finally some smart levelheaded soul shouts out that the Emperor is totally nekked. Myths are the stories that define culture. They are the stories that frame the identity and the purpose of a people. They provide the overarching narrative of a society, and are told and retold as a way of reaffirming who we are. Any competent historian or anthropologist can tell you this. That's not how the reality television level of thinking understands it, of course. But if you've been college educated at any halfway decent school, and have gotten a liberal education in the classical sense of the word, then this understanding of the role of mythopoetics isn't news. We understand the world through narrative. It's our nature. The bright, sentient course of action is to celebrate in and rejoice in those stories that define us. Sing the carols. Feel the gracefulness of the season, its hope, its essential themes of promise and new birth and restoration. It's the reasonable thing to do.